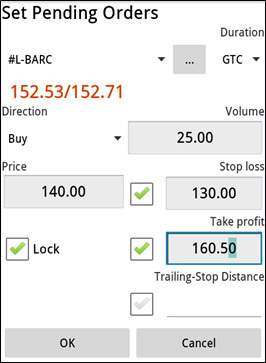 by "Set Order" function from the context menu when choosing a particular instrument in the "Quotes", "Open positions", "Sum open positions" and "Orders". by "Set Order" function from the context menu when clicking the upper-right corner button in the form of 3 points - in this case the list of instruments will open in alphabetic order. by the second button in the bottom toolbar. 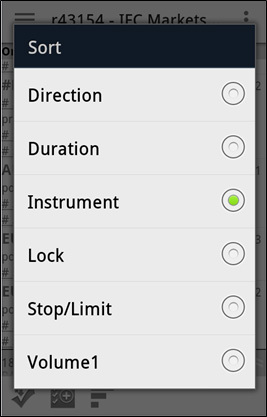 You may also choose another instrument for the order from the list of the used instruments (by the button in form of a top down triangle) or from the Instrument browser (button in form of 3 dots); both buttons are located in the upper-right corner of the window. 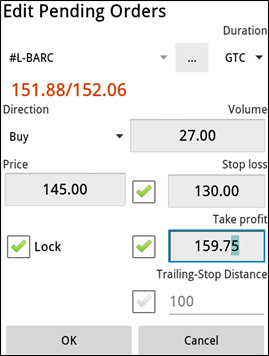 If this operation was not performed for any reason (for example, the order price was too close to the market price), reasons for rejection will be indicated in this window. 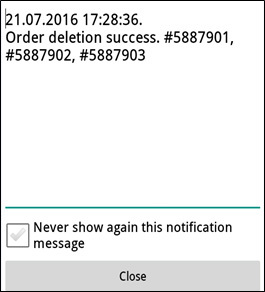 Additionally, you can cancel further notifications about the results, ticking the checkbox "Never show this notification message". Close the notification window, by clicking "Close" button or the hard button "Back". 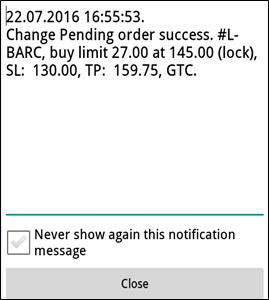 Moreover, orders (Take Profit and Stop Loss) linked to open positions are specifically displayed in this table: the position is displayed and order TP and SL orders. 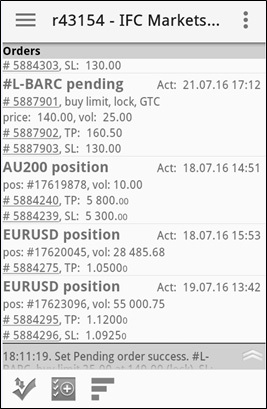 For example,"AU200 position" and two orders TP and SL. 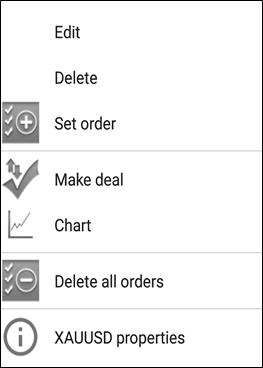 Orders may be sorted by 6 feautures: order direction, duration, instrument, presence of lock mode, Stop/Limit linked orders and the asset volume in the order. 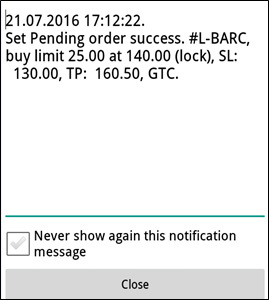 Close the notification window, by clicking "Close" button or by hard button "Back". View the properties of the selected instrument. Close the notification window, by clicking "Close" button or by the hard button "Back".